Wondering how to make your child eat different cereals? Here is a recipe which can add iron into your child's diet and ensure help in better haemoglobin levels. 1. Combine all the ingredients except the butter and knead into soft dough using enough warm water. 2. Add the butter and knead again till the dough is smooth and elastic. 3. Cover with a damp muslin cloth and keep aside for 25 to 30 minutes till the dough proves (rises) and doubles in volume. 4. Divide the dough into 2 equal parts and roll out each portion into a 4" x 5" sheet of 6 ¼" thickness. 5. Cut each sheet into crunchies, 2" long and 1" wide. 6. 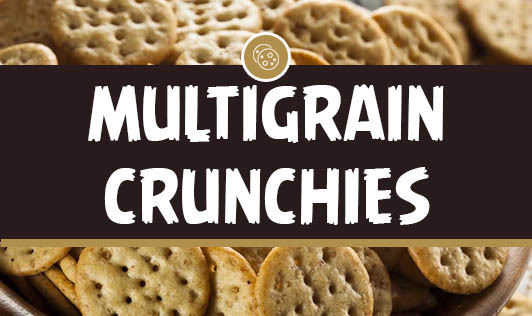 Place crunchy on a greased baking tray at a distance of 1" from each other and bake in a pre-heated oven at 140°C for 40 minutes or till the crunchies are crisp and golden brown.